David Thomas is Professor and Chair of the Department of Geography at the University of Sheffield. He is the author of seven books and over 100 refereed research papers in journals and edited volume contributions. Recent work includes Desertification: Exploding the Myth (with N. J. Middleton, 1994); Arid Zone Geomorphology: Process, Form and Change in Drylands (ed., 2nd edn, 1997) and World Atlas of Desertification (with N. J. Middleton, 2nd edn, 1997). he was also Head of Development and a Pro-Vice-Chancellor from 1995 to 1997. His previous books include Environmental Change (with Stephen Stokes, 4th edn, 2000), The Nature of the Environment (Blackwell, 3rd edn, 1993), The Changing Earth (Blackwell, 1995), The Human Impact Reader (Blackwell, 1997), The Earth Transformed (with Heather Viles, Blackwell, 1997) The Human Impact on the Natural Environment (5th Ed. Blackwell, 1999). 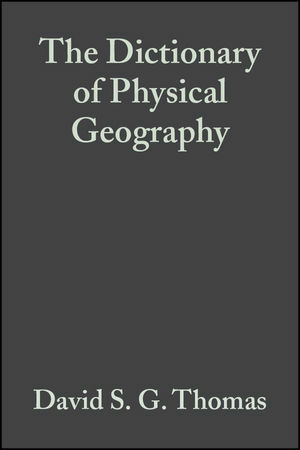 The Dictionary of Physical Geography. Updated and revised under the guidance of a new international team of experts. Includes new entries on current relevant topics and themes.